Well, Door Prizes this year – drawn from names entered of those who created and read – which means every participant was a winner this year! Yeah! 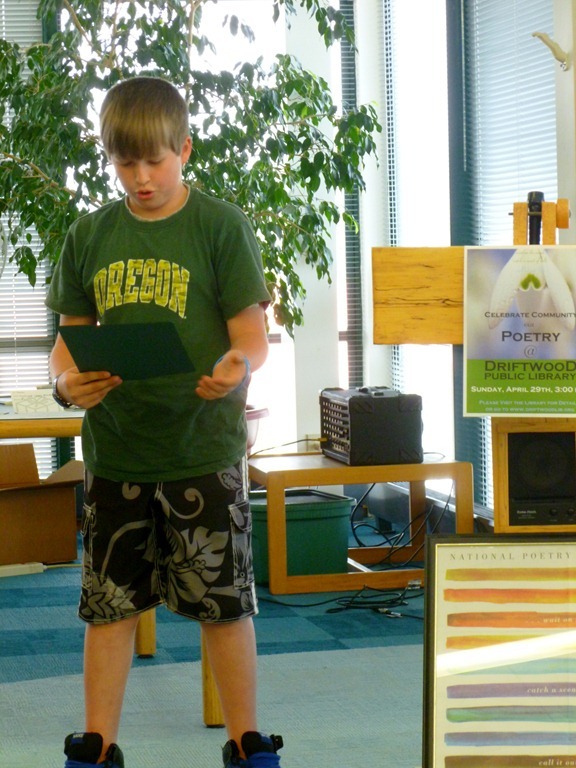 Have I mentioned that for the past two years Nathan has won the Lincoln City Poetry Contest at the Library? 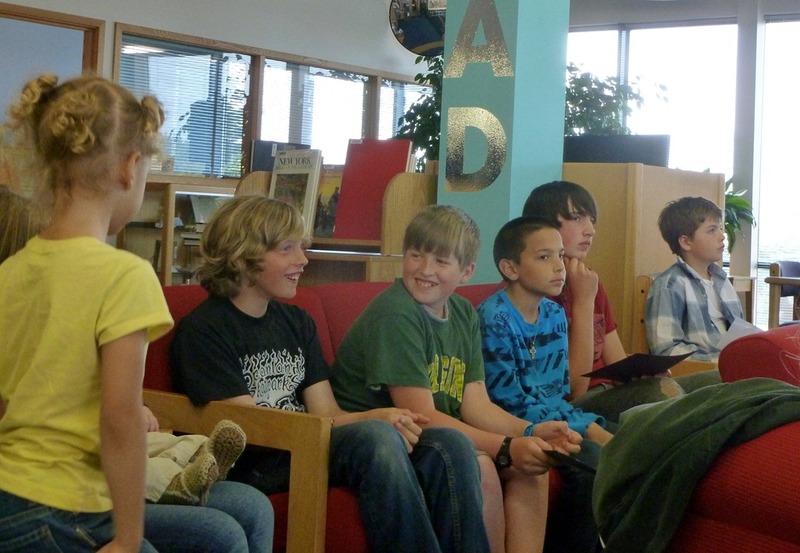 (I think I may have mentioned that before.. . . ) I was excited for this year, but for whatever reason – the boys were not excited about writing for the Library. by Poet Laureate of the United States, Philip Levine. …Wait on the wind, catch a scent of salt, call it our life. sight, sound, touch, smell, and taste, to capture a “sense” of our community. At the same time we heard about the upcoming Poetry Month Challenge – we also were excited about the March Writing Lesson from the Schoolhouse Teacher’s Website – Color Poems. Kim Kautzer of WriteShop is our tutor. She gave us teaching tips on how to get started, and then more teaching helps on how to challenge the different age levels – Teens to Primary Grades. She broke it down simply for us, and included a 3 page worksheet to help us along. The first page had samples from kids aged 10, 13 and 15. The Second Page had a thoughtful brain storming activity. Targeting the color of your choice , she asked questions like “What things smell blue?”. Blueberry pancakes? She also had links to a couple of thesauruses help with extra synonyms. The third page had a fill in the blank sheet to help you put together your poem. It was a simple fun activity. The boys and I picked our colors. It took a bit of adjusting to think of what Feels Red. What Sounds Red. What Tastes Red. What does a Color Smell Like? Jon chose Green, Nate chose Purple and I choose Red. We happen to be reviewing a product for WriteShop that I’m excited to share in a couple of weeks. I can let you know that her preparation to help my boys ease into writing is fantastic. 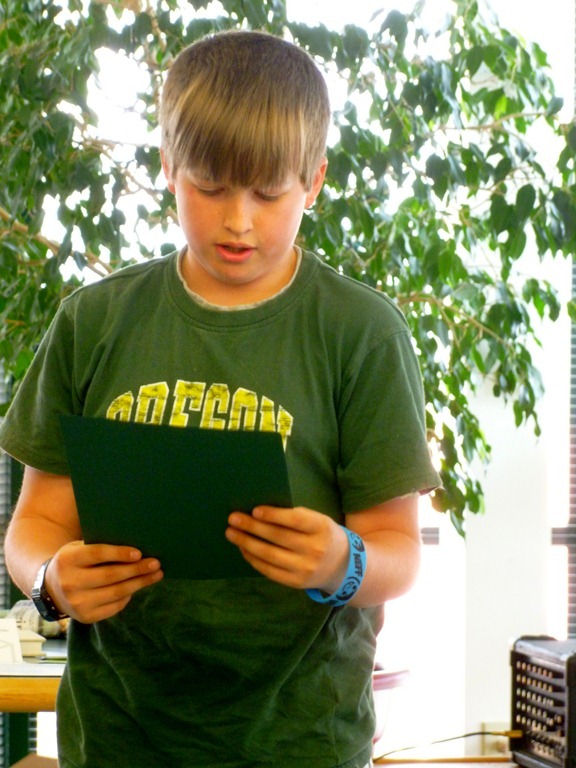 Have you had your 5th grade boy say – Is this Writing? It’s too easy. Ya. I am really enjoying it! Thank You Ron and Teena for encouraging the boys to step out! Thank you fellow participants! Thank You Kim for your Lessons, and Thank you SchoolhouseTeachers.com! (This is just a glimpse of our actual life. 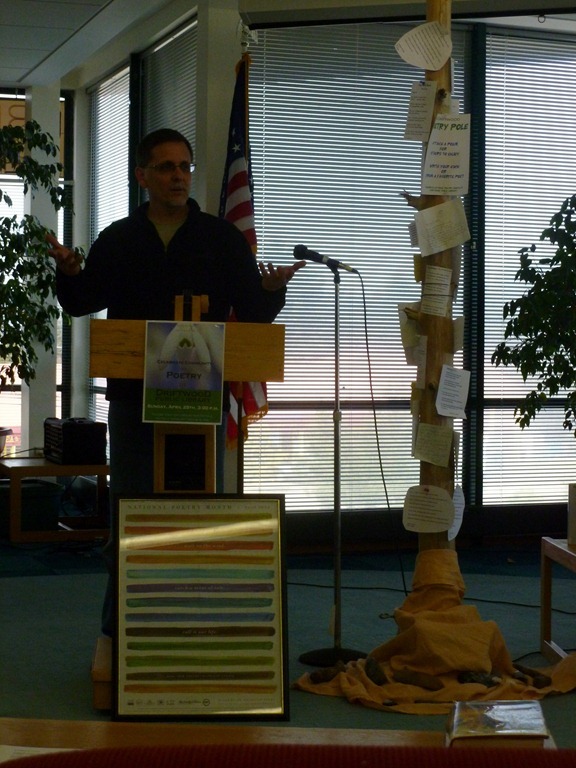 This entry was posted in Some Schooling and tagged Driftwood Public Library, HomeSchool, HSBlogger, Oregon, Poetry, WriteShop. Bookmark the permalink. 1 Response to Poetry Prizes Again!